Q: On December 19, the German cabinet approved an amendment to its administrative regulations, lowering the threshold where national security reviews could apply to non-EU share purchases to 10 percent in the defense, high-tech and infrastructure sectors. What is your comment? A: The Chinese side has taken note of relevant reports. We will be closely following the changes in Germany's foreign investment review regulations and their impacts. China believes that it is understandable to have certain necessary security reviews in the investment field. But security reviews shall not be used as a tool to advance protectionism and erect new invisible barriers. It is even less acceptable to take discriminatory actions that are clearly targeting others. We also noted that some in the economic community in Germany have already made their concerns heard over the tightening of foreign investment review regulations, believing that it could hurt Germany's image as an investment destination and open market. In face of the complex situation of rising protectionism and unilateralism, especially when the world economy is facing greater factors for uncertainty and instability, China and Germany, as the world's major economies, have a shared responsibility to maintain free trade and multilateralism. Our two countries should work together to expand two-way openness to inject positive energy to the high-level mutually beneficial cooperation and maintain an open world economy, and avoid sending negative signals that could affect investment environment and market confidence. Q: The United States has announced a full withdrawal of US troops from Syria. I wonder if China has any comment on this? A: Over a recent period of time, thanks to the concerted efforts of the international community, the terrorist and extremist groups in Syria have been dealt a heavy blow. The Syrian issue is now in a new critical stage with a rising momentum for political settlement. 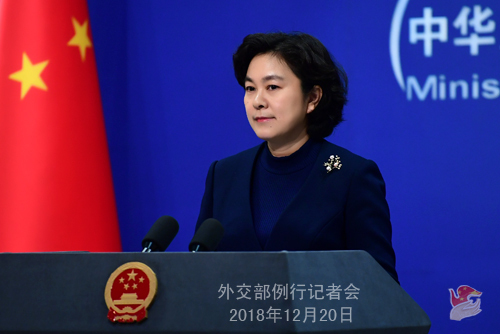 China always believes that Syria's sovereignty, independence and territorial integrity should be respected and the future of Syria should be independently decided by its people. Under the current circumstances, we hope that the relevant parities can join hands to create conditions to start the inclusive "Syrian-led and Syrian-owned" political process as soon as possible and promote the proper settlement of the Syrian issue at an early date. This serves the common interests of the international community. Q: The New York Times reported that a special economic zone under the China-Pakistan Economic Corridor is being proposed by Pakistan. Can you confirm this? If so, can you share more details about this new special economic zone? A: I'm not aware of the situation you mentioned, and I need to check on that. Q: Can you confirm the reports that a Canadian English teacher named Sarah Mciver has been recently detained in China? What is the reason for the detention? Where is she being held? A: Some of you raised questions on the detention of one more Canadian national at yesterday's press conference. After that, we tried to learn about the case. Indeed, recently, a local Chinese public security authority imposed administrative penalty on a Canadian national for illegal employment. I would refer you to the relevant public security authority for specifics. What I can tell you is that China and Canada maintain unimpeded consular communication and that the Chinese side will provide necessary assistance for the Canadian side to fulfill normal consular duties. Q: The Washington Post reported that China is reviving its reeducation-through-labor camps now in Xinjiang in the form of "reeducation camps". This has become one of the world's most urgent "human rights crises", and China must hear loud and clear that the world will not stand by. What is your comment on that? A: I noticed that yesterday, the New York Times and the Wall Street Journal made a report on this respectively. The latest piece I saw is the one made by the Washington Post as you just described. The relevant reports represent a grave distortion of and a vicious attack at the facts and showcase no trace of the professional ethics of the press. No wonder that the US leader has been critical of some US media. First, I want to say that the reeducation-through-labor system has been abolished in China. 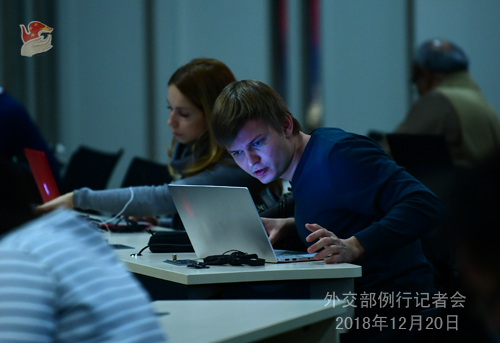 The vocational education and training programs in Xinjiang cannot be further different from the so-called forced labor as reported by the US media. As Shohrat Zakir, Chairman of the Government of Xinjiang Uygur Autonomous Region, said in an interview in October, vocational learning at the vocational education and training institutions in Xinjiang is taken as a key way to help trainees find employment. Courses on clothing and footwear making, food processing, electronic product assembly, typesetting and printing, hairdressing and e-commerce have been set up to suit local social needs and job market. Multi-skill training is provided to trainees who have the desire and capability to learn, so that they acquire one to two vocational skills upon graduation. Businesses in garment making, mobile phone assembly and ethnic cuisine catering are arranged by the local government to offer trainees practical opportunities. In the meantime, they are paid wages in a certain way. The mechanism has taken shape in which the trainees can "learn, practice and earn money." According to what I have learned, southern Xinjiang alone has 22 counties and 1.63 million people stuck in deep-rooted poverty. The poverty eradication measure for Xinjiang in 2018 is to have a per capita disposable income of around 3,300 yuan, which is less than 400 yuan a month. Through making their own choices on the vocational training and employment opportunities, the trainees can basically help realize the goal of "one member gets employed, the whole family gets lifted out of poverty" as they embark on a new journey of their life. If this is called "forced labor" or even "human rights crisis", I would like to ask the Washington Post and other US media to interview those ethnic minority groups in their country struggling on the brink of poverty and unemployment, asking them how they think of this issue and whether they regard such vocational training as "crisis" or "opportunity". I also want to ask those US media who have been working tirelessly to demonize China's efforts on counter-terrorism, de-extremism and poverty eradication, what have you done in face of the 45 million poverty-stricken people and grave racial discrimination issues in the US? We warn these media and people in the US that they should not let ignorance and foolishness blind their sights, and arrogance and prejudice evacuate their minds of reason. Q: Are the reports true that the Canadian detained will be returned to Canada soon? A: I am not aware of that. I would refer you to the relevant public security authority. Like I said, she was imposed administrative penalty by the public security authority for illegal employment. Q: Is the case of the Canadian who was imposed administrative penalty the same with the one involving the two Canadians that have been detained by Chinese state security departments in terms of nature? A: The former two Canadian nationals were imposed compulsory measures by China's national security departments on suspicion of engaging in activities that endanger China's national security. The person you just mentioned was imposed administrative penalty by public security authority for illegal employment. Q: You mentioned that we could ask the relevant authorities for more information. In the case of the first two Canadians, the authority was the the Beijing State Security Bureau and the State Security Bureau of Dandong City, Liaoning Province. And in this case, is it also the state security departments we should contact or is it the Ministry of Public Security or some other government agency? A: Like I just said, it is the security authority in the cases of the two Canadians and the public security authority in the case of this Canadian citizen. Q: Australian academic Kevin Carrico said that he was followed by the staff of Wen Wei Po media in Hong Kong, which could be the Chinese government's way of intimidating him and preventing people from talking to him or a signal to Hong Kong to refuse entry on his next visit. What is your comment? A: Don't you think the logic here is quite ridiculous, this Australian academic you mentioned claiming he was stalked by a Hong Kong media agency as a way to intimidate him by the Chinese government? I'm not aware of the situation at all, but I believe his logic is very absurd and untenable. Q: Is this right that the problem with this Canadian's visa was not that it was out of date, but rather she had the incorrect work visa for the type of work she was doing. Is that right? A: Your question is rather specific. If you want to learn more details, you may refer to the relevant public security authority. What I can tell you is that she was imposed administrative penalty due to illegal employment. Q: The US administration has signed into law the Reciprocal Access to Tibet Act of 2018 which could result in some Chinese officials being banned from access to the US. What is your comment? A: We express strong opposition to the US, who is obstinate in signing into law the so-called Reciprocal Access to Tibet Act of 2018 adopted at the Congress. Just as we pointed out on many occasions, the act has severely violated the basic norms governing international relations, grossly interfered in China's domestic affairs, sent out a seriously wrong signal to the Tibet Independence separatist forces and been highly detrimental to the exchanges and cooperation between China and the US. I have to stress that Tibet affairs are purely China's domestic affairs and allow no interference from other countries. Tibet and the Tibetan-inhabited areas in other four provinces are open to foreigners. Since 2015, nearly 40,000 visits have been made to Tibet by Americans alone. Besides, considering the geographical conditions and climate there, it is entirely necessary for the Chinese government to take certain administration measures on the access to Tibet by foreigners in accordance with laws and regulations, which is beyond reproach. The relevant accusations leveled against China by the US act disregard the facts and are fraught with biases. We will never accept that. If the US puts this act into effect, it will certainly cause serious harm to the bilateral relations and exchanges and cooperation in key areas. The Chinese side will surely take forceful measures to firmly safeguard its own interests. China's door to the outside world will only open wider and wider, and Tibet will become more and more open. China welcomes more and more foreigners to Tibet for visit, travel and business, and this policy will remain unchanged. But the precondition is that they must abide by the Chinese laws and relevant regulations and go through necessary procedures. 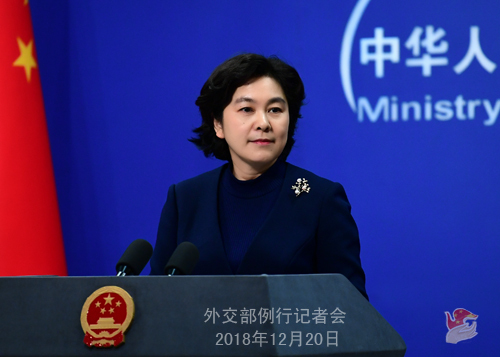 We urge the US side to fully realize the highly sensitive nature of Tibet-related issues, stop using them to interfere in China's internal affairs and refrain from putting the act into effect, otherwise the US itself has to bear all the consequences that may cause.